Sept 6 (Reuters) - Kentucky's "unapologetically pro-life" governor and the state's last abortion clinic will square off on Wednesday in a federal courtroom in a case that could make it the first U.S. state without an abortion provider. In a three-day trial, the state will argue before a U.S. District judge in Louisville that EMW Women's Surgical Center does not have proper state-required agreements with a hospital and an ambulance service in case of medical emergencies. 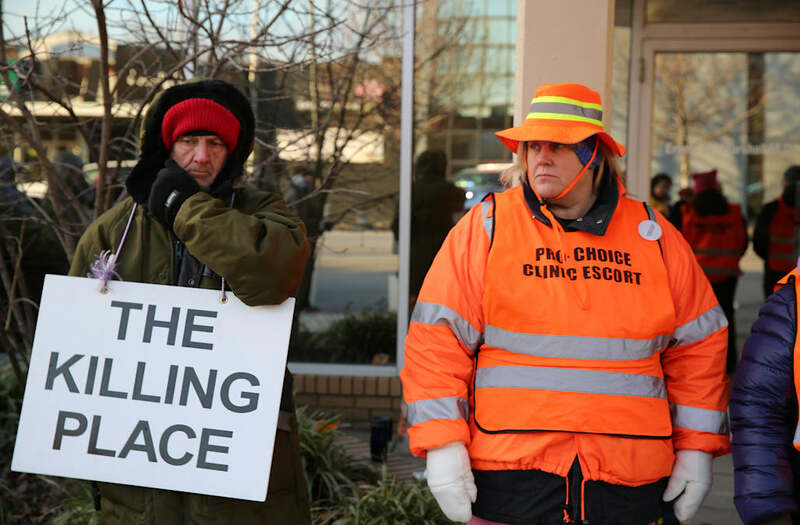 "In 37 years providing abortion, I've seen more than a dozen clinics close down in our state, and now ours is the last clinic standing in the entire state," Ernest Marshall, a doctor and EMW clinic founder, said in a statement. An anti-abortion protester with tape over her mouth demonstrates outside the U.S. Supreme Court before the court handed a victory to abortion rights advocates, striking down a Texas law imposing strict regulations on abortion doctors and facilities in Washington June 27, 2016. Demonstrators hold signs outside the U.S. Supreme Court as the court is due to issue its first major abortion ruling since 2007 against a backdrop of unremitting divisions among Americans on the issue and a decades-long decline in the rate at which women terminate pregnancies in Washington, U.S. June 27, 2016. Protesters demonstrate in front of the U.S. Supreme Court on the morning that the court took up a major abortion case focusing on whether a Texas law that imposes strict regulations on abortion doctors and clinic buildings interferes with the constitutional right of a woman to end her pregnancy in Washington March 2, 2016. Anti-Trump demonstrator protests at abortion rights rally in Chicago, Illinois, January 15, 2017. Pro-choice activists celebrate on the steps of the United States Supreme Court on June 27, 2016 in Washington, DC. In a 5-3 decision, the U.S. Supreme Court struck down one of the nation's toughest restrictions on abortion, a Texas law that women's groups said would have forced more than three-quarters of the state's clinics to close. Pro-life activists gather outside the Supreme Court for the National March for Life rally in Washington, DC, U.S. January 27, 2017. Pro-life activists gather for the National March for Life rally in Washington January 27, 2017. Pro-Choice supporters of Planned Parenthood rally outside a Planned Parenthood clinic in Detroit, Michigan, U.S. February 11, 2017. A man holds up a rosary in front of competing demonstrators displaying pro-life and pro-choice signs as the annual March for Life concludes at the U.S. Supreme Court in Washington, DC, U.S. January 27, 2017. Siberian Husky Tasha wears a "Huskies for Choice" sign while held by her pro-abortion owner Michelle Kinsey Bruns in front of the Supreme Court during the National March for Life rally in Washington January 22, 2016. The rally marks the 43rd anniversary of the U.S. Supreme Court's 1973 abortion ruling in Roe v. Wade. A man stands during an anti-Planned Parenthood vigil outside the Planned Parenthood - Margaret Sanger Health Center in Manhattan, New York, U.S., February 11, 2017. Karen Lieber joined anti-abortion activists protesting in front of Planned Parenthood, Far Northeast Surgical Center in Philadelphia, Pennsylvania, U.S., February 11, 2017. Anti-abortion supporters Marian Rumley, Taylor Miller and Sophie Caticchio from Minnesota listen to speeches at the National March for Life rally in Washington January 22, 2016. The rally marks the 43rd anniversary of the U.S. Supreme Court's 1973 abortion ruling in Roe v. Wade. The Franciscan Friars Minor gather between The Supreme Court of the United States and The Capitol Building during the 44th annual March for Life January 27, 2017 in Washington, DC. Anti-abortion advocates descended on the US capital on Friday for an annual march expected to draw the largest crowd in years, with the White House spotlighting the cause and throwing its weight behind the campaign. Pro-choice and pro-life activists demonstrate on the steps of the United States Supreme Court on June 27, 2016 in Washington, DC. In a 5-3 decision, the U.S. Supreme Court struck down one of the nation's toughest restrictions on abortion, a Texas law that women's groups said would have forced more than three-quarters of the state's clinics to close. Pro-life activists pray on the steps of the United States Supreme Court on June 27, 2016 in Washington, DC. In a 5-3 decision, the U.S. Supreme Court struck down one of the nation's toughest restrictions on abortion, a Texas law that women's groups said would have forced more than three-quarters of the state's clinics to close. Pro-choice demonstrators at the U.S. Supreme Court cheer as they learn the court struck down the Texas abortion law on Monday, June 27, 2016. View of demonstrators in front of the United Nations as they protest against a proposed abortion ban in Poland, New York, New York, April 17, 2016. "The very right to access legal abortion in the state of Kentucky is on the line," he added. The case could test court interpretations of last year's U.S. Supreme Court ruling that struck down parts of a Texas law that required clinics to meet hospital-like standards and for clinic doctors to have admitting privileges at nearby hospitals. Despite that ruling, conservative legislatures and Republican governors such as Kentucky's Matt Bevin have continued to tighten new regulations on abortion clinics. "It is telling that the abortion industry believes that it alone should be exempt from these important safety measures," said Bevin spokeswoman Amanda Stamper.